Henri-Louis Bergson (18 October 1859 - 4 January 1941), was a French philosopher. Bergson convinced many thinkers that the processes of immediate experience and intuition are more significant than abstract rationalism and science for understanding reality. He was born on the Rue Lamartine in Paris, France. His mother, Katherine Levison, was of English and Irish Jewish descent. 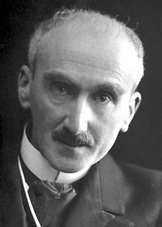 His father, the pianist Michał Bergson, was of Polish Jewish descent. His early childhood was spent mostly in London after his birth. He learned the English language from his mother. He returned to Paris when he was nine years old, and became a naturalized French citizen. He attended the Lycée Fontanes in Paris from 1868 to 1878. There he was given the 1877 prize for school mathematics, for the solution of a mathematical problem. When he was nineteen, he studied at École Normale Supérieure (ENS). He read many philosophy books, especially Herbert Spencer. He was given the 1927 Nobel Prize in Literature. In 4 January 1941, Bergson died in occupied Paris from bronchitis. This page was last changed on 19 October 2017, at 08:40.